Valle de Bravo One natural phenomenon that has always been captivating, not only to me, but our entire family, has been the epic 3000-mile migration of the gorgeous monarch butterflies. 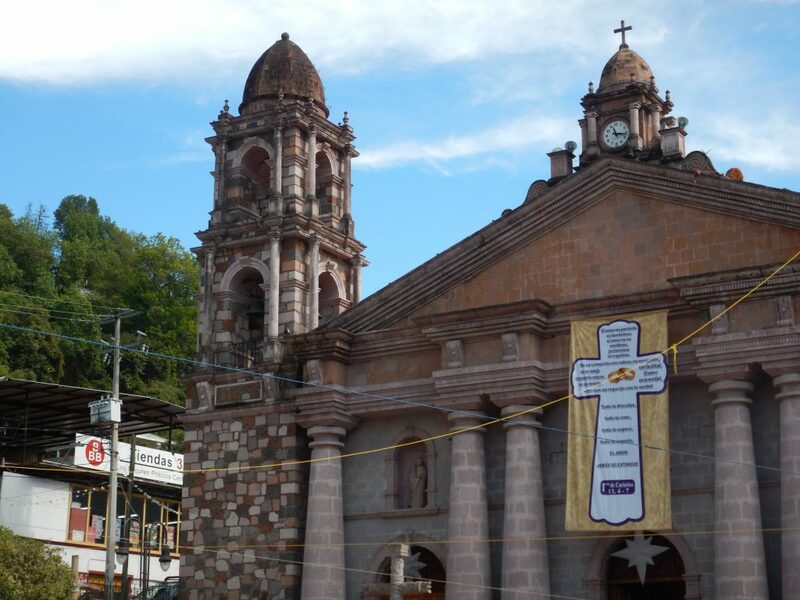 Their journey ends in several states in Mexico, Michoacan and Estado de Mexico. Valle de Bravo is reputedly in the heart of the Ruta de Mariposa, the route of the butterflies. We asked around. The Mexican government runs and maintains several biospheres for the monarchs, including a couple that are open to the public year-round. Research indicated that we were not far away. There was a nearby site that would involve riding horseback up 3000 feet, but we were at the right time of year to see them, assuming the skies were not overcast. The local tourism information office scribbled on a map and assured us that we were hardly a half-hour distant. The hours were supposedly 11 AM to 4 PM. What a great way to celebrate Christmas. In order to make sure the gate was not blocked, I moved the car out onto the street at 530 AM on Christmas morning. Everyone was up and good to go. We pulled out hardly minutes after 10AM, giving us time to get there, make sure we could get horses, even get lost, and still be in great shape. The tourism map was more a marketing tool than a map. We had downloaded Google Maps for the area, inserted the name of the monarch sanctuary and were off. Strangely, a half-hour out of town we seemed to be going north, not south, as we had expected. Infrequent signs still indicated that we were on Ruta de Mariposa though, and Google was staying the course, though it looked like it would take us almost an hour, so we proceeded. We were driving up and down mountains marked curvas peligrosa, dangerous curves, through beautiful pine forests speckled with farming and rural villages. Right before 11 AM we heard Google’s voice say, “you have arrived at your destination.” I pulled over. We were at a crossroads with a sign. We went straight another kilometer or two. Nada. I u-turned back to the crossroads and pulled up between three taxis on the side of the road. They confirmed what we already knew. We were not at a monarch sanctuary. None of them knew exactly how to get to one either, never having been. A woman passenger in one taxi swore there was one another 40 minutes down one fork in the road, but was unsure. We drove a couple of kilometers down the fork and stopped two young men. No, there was no sanctuary anywhere near. We must have made a mistake when we noticed we were going north. 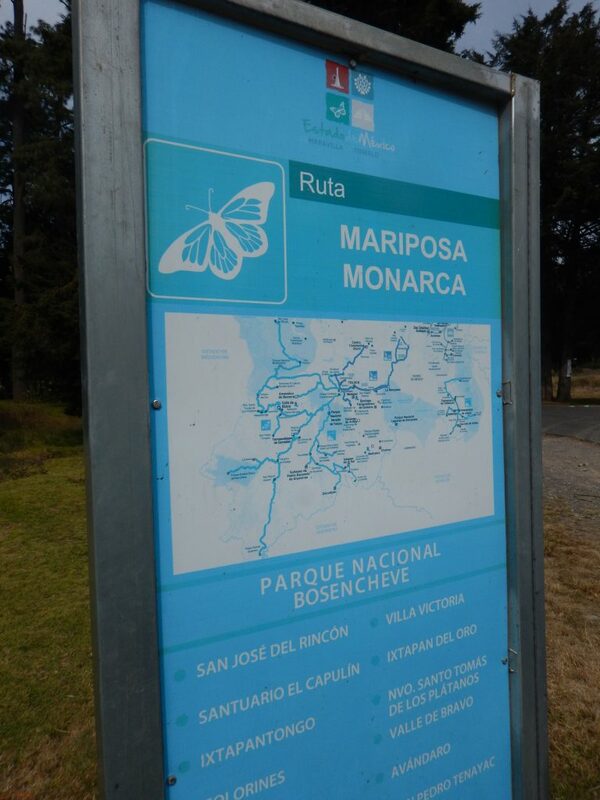 We drove back until we saw another Mariposa sign with the route outlined. It turned out from the sign that we were at a park at the very northern end of the route. Other locations were all south of us. We doubled back and drove along the lake around the town of Valle de Bravo. At dockside another tourist information office assured us that we were on the right path now. Yes, it might take us until 1 PM, but we would still make it to Temascaltepec, and we would be set. We pulled in there right before 1PM. No one had any idea where to find the butterflies or the reserve. We asked various people in the center of town. No one had ever seen them, although, yes, they were around here somewhere. 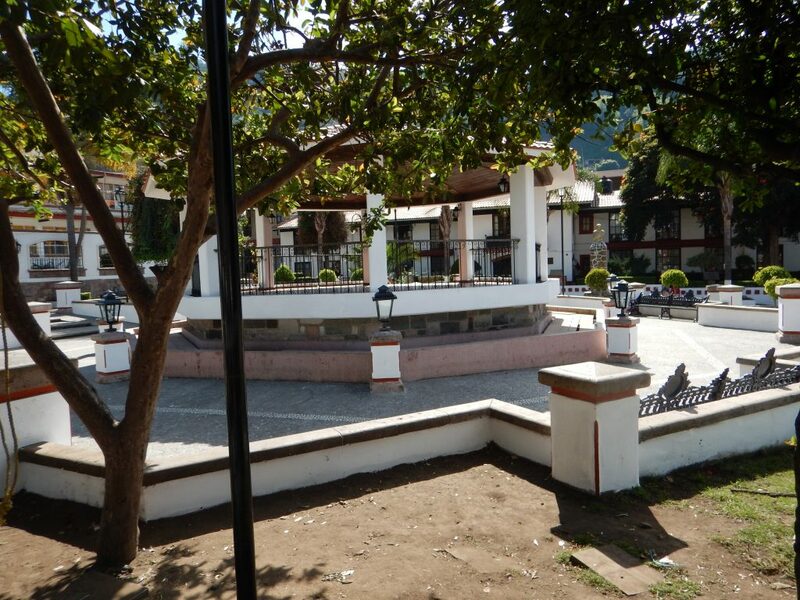 Monarch butterflies decorate one of the main squares of Valle de Bravo. In Temascaltepec, butterflies were drawn on the tiles next to the park. One young man knew someone who was a guide, but it always cost too much money to see them, so no one had been there. National Geographic has regularly informed me that the monarchs are in trouble and their habitat is endangered by climate and population shifts shrinking their numbers. Perhaps this is like all of the alien movies that focus on the crater site near Winslow, Arizona, where there used to be rumors of secret government testing and UFOs? Google Images supplied pictures, so it must truly be there, even if Google Maps, tourist information officers, local police and residents, have no earthly idea how to get there or where it really is. This is another case study on the wonderful adventure of traveling and a mystery to be solved at some later date. 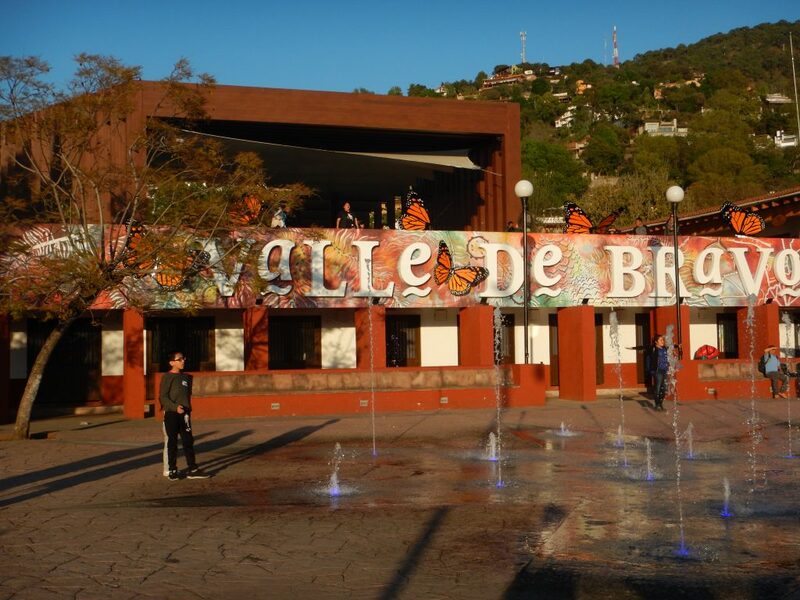 This entry was posted in Ideas and Issues and tagged Butterflies, mexico, Monarchs, Valle de Bravo by Wade. Bookmark the permalink.